Fig. 1-13. Artinskian: radiolarian beds with Copicyntra acilaxa – Quinqueremis arundinea. Fig. 1-4, 6, 9-13 - North Dipression Side Zone, Karachaganak Massif, borehole 13, sample 3061 (depth 4995-5001 m); fig. 5, 7, 8 - West Dipression Side Zone, Aransay Massif, borehole P-2 (depth 4533-4560 m). Fig. 1, 2. Copicyntra acilaxa Nazarov: 1 - FF-P229/201-00337 (bar=115µm); 2 - FF-P229/201-00331 (=50µm). Fig. 3. Spongentactinia fungosa Nazarov, FF-P229/228-00224 (=115µm). Fig. 4. Rectotormentum fornicatum Nazarov et Ormiston, FF-P229/227-00330 (=50µm). Fig. 5, 6. Copiellintra bispina Nazarov et Afanasieva: 5 - FF-P229/214-05507 (=60µm); 6 - FF-P229/214-00329 (=50µm). Fig. 7. Copiellintra diploacantha Nazarov et Ormiston, FF-P229/215-05508 (=60µm). Fig. 8. Quinqueremis arundinea Nazarov et Ormiston, FF-P229/226-05509 (=175µm). Fig. 9, 10. Pluristratoentactinia conspissata Nazarov: 9 - FF-P229/224-00328 (=54µm); 10 - FF-P229/224-00325 (=54µm). Fig. 11. Tormentum aequilateralis orbiculatum Nazarov, FF-P229/218-00334 (=115µm). Fig. 12. Tormentum aequilateralis Nazarov, FF-P229/217-00333 (=136µm). Fig. 13. Entactinia cf. pycnoclada Nazarov et Ormiston, FF-P229/202-00304 (=50µm). Fig. 14-18. Sakmarian: radiolarian beds with Copiellintra bispina – Spongentactinia fungosa. North Dipression Side Zone, Karachaganak Massif: fig.14-16, 18 - borehole13, sample 3312 (depth 5030-5037 m); fig. 17 - borehole 9, sample 390 (depth 4344-4351 m). Fig. 14. Copiellintra bispina Nazarov et Afanasieva, FF-P229/214-00324 (=50µm). Fig. 15. Entactinia cf. pycnoclada Nazarov et Ormiston, FF-P229/202-00327 (=115µm). Fig. 16. Copicyntra acilaxa Nazarov, FF-P229/201-00336 (=115µm). Fig. 17. Spongentactinia fungosa Nazarov, FF-P229/228-00117 (=100µm). Fig. 18. Rectotormentum fornicatum Nazarov et Ormiston, FF-P229/227-00322 (=50µm). Fig. 19-22. 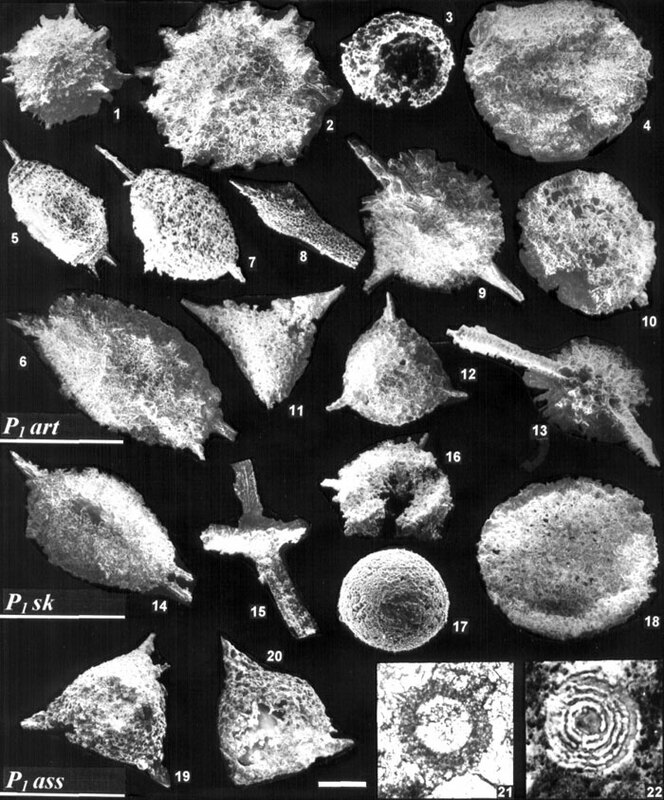 Asselian: radiolarian beds with Tormentinae. North Dipression Side Zone, Karachaganak Massif, borehole 12: fig.19-22 - sample 593 (depth 4604-4611 m), fig. 20 - sample 576 (depth 4548.9-4556.8 m). Fig. 19. Tormentum aequilateralis orbiculatum, FF-P229/218-00310 (=115µm). Fig. 20. Tetratormentum narthecium Nazarov et Ormiston, FF-P229/219-00338 (=115µm). Fig. 21. Tormentum sp., FF-L009/229-00712 (=100µm). Fig. 22. Copicyntra sp., FF-L009/230-00715 (=100µm).